as We Make Way for BIG Changes! If you’ve visited recently, no doubt you’ve noticed we’re getting muddy and dusty with some major construction in our Wolf Woods and outdoor moose areas. The Zoo is committed and excited to embark on a new Elephant Exhibit, serving as Phase I of a new master plan, spanning the next 10 to 20 years. This future elephant and mixed species exhibit meets the Association of Zoos and Aquariums (AZA) standards for elephant care. The exhibit will be completed by June 2019. 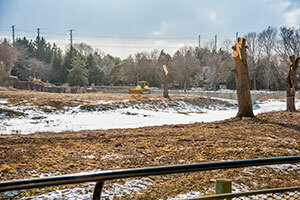 The future home for elephants includes a larger outdoor habitat for our African elephants, Ruth and Brittany, an indoor barn, and space for a mixed-species exhibit featuring a new species to the Zoo, yellow-backed duikers (medium-sized African antelope). In addition, the current herds for zebra, impala and bongo will be expanded. In the areas of Wolf Woods and outdoor Moose, visitors will now see construction fencing has been installed and trees removed in anticipation of the new exhibits. Female moose, Robin and Bella, have been moved to an off-exhibit area behind the Small Mammals Building; timber wolf, Nikan, has relocated to the former eland exercise yard in the off-exhibit Winter Quarters area. (Wolves may return to the collection in the future, as the master plan unfolds.) Our brown bear, Boris, has moved to the Black Bear Exhibit, and after hibernation, he’ll share space and time on public display with the black bears. Repurposing of the Australia building is scheduled to begin sometime this spring/early summer, however from now until the end of March, the building remains open for visitors, with access through one entrance on the west side. Australian animals will have new homes in AZA-accredited institutions, or other facilities vetted by the Milwaukee County Zoo’s Senior Animal Staff. 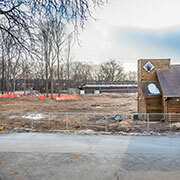 Funding for the first phase has been approved as a 50% contribution from Milwaukee County and the Milwaukee County Zoo, and a 50% contribution from the Zoological Society of Milwaukee. 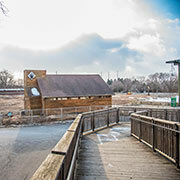 The Zoo and the Society serve as a public-private partnership, helping to fund projects, and strengthen the efforts and overall mission of the Zoo. As Phase I moves forward in the coming months, we’ll have further details to share, and we anticipate an official groundbreaking to take place sometime this spring. We invite you to continue to follow us here on the website, social media platforms and through your Zoo visits…and watch us grow!